Effie and Paladin appear to be sharing secrets on the comfortable rug atop the dryer. Or maybe they’re planning their day in Effieland. Effie (right) and Paladin (left) suddenly decided to have breakfast together at her usual place. They have always before eaten in separate rooms, she in the dining room and he in my study. Today they shared their breakfast at her place. They each have two bowls of food in their respective areas, one of kibbles and one of tinned food, as well as a bowl of water. On this occasion, she ate the tinned meat and he munched the kibbles.It appears to be a new breakthrough in domestic closeness that I find heartening. Today is Paladin’s first day outdoors since his neutering surgery, and his first time ever in Effieland. Effie is taking him on a tour of her dominion to celebrate. 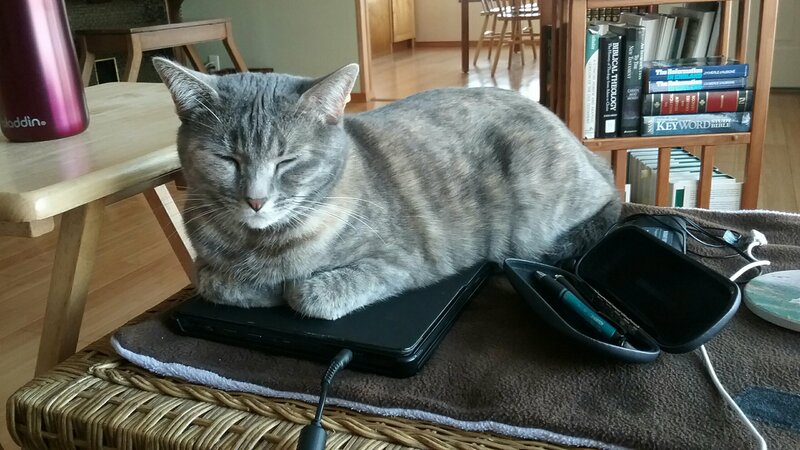 Effie is probably soaking up my thoughts as she reads my mind in her sleep; or, more likely, she’s bored and wants to try my computer as a napping place (I’m using my phone to email a friend). She does have an engaging way of sleeping. Effie and Halvor: Can they go on meeting like this? All we need to cinch the drama is a balcony! At least Romeo and Juliet were not obliged to contend with a screen. My and Effie’s very dear friend Jane made a marvelous little kerchief/cape for Effie. Even the envelope delighted us, addressed to “Miss Effie” in my care. Effie now has a special Christmas garment, and she looks like Cat Supergirl. Thanks from our hearts, Jane!